Expedia has some excellent Dnipro travel packages waiting for you. Bundling your flights and lodgings is one of the most straightforward ways to save money on your upcoming adventure. Secure your package deal on Expedia and save up to 21.4%*. Search our international database of more than 400 airline partners and 321,000 worldwide properties. Too many on there to choose from? Don't stress — we can help you decide! It's nice to just wander the streets when you're somewhere new, but sometimes it's a wise idea to have a plan in place. Grab your travel schedule — we have some awesome ideas for your forthcoming Dnipro holiday. Sometimes the most meaningful scientific discoveries are found in nature. At National History Museum you can find out more about our amazing natural world. There's a great range of things to keep you busy in this destination. Inquire about visiting hours at Preobrazhensky Cathedral. When you're there, why not take a couple of moments to close your eyes and reflect and reconnect with your spiritual side. Still got some time to spare? If you're in the mood for a bit of spiritual enlightenment, pay a visit to St Nicholas Church. You never know, you may even discover the answers to one or two of life's most perplexing questions! With around 13 accommodations on offer, you won't have any troubles finding a terrific place to stay. Lock in a bed for your next luxury getaway or cheap holiday via Expedia and enjoy a good night's shut-eye in Dnipro. If you'd rather not browse the net for hours for a place to stay, why not check out our suggestions? 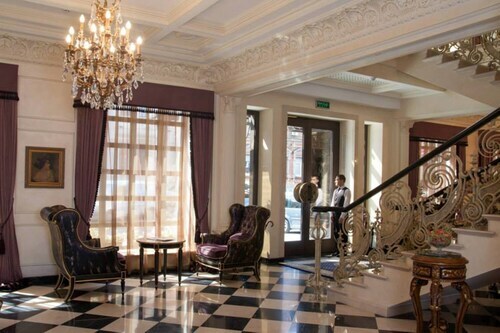 The Grand Hotel Ukraine and Hotel Academy are some of the nicest properties in the area. Based just 7 miles (11 km) away, Dnepropetrovsk International Airport (DNK) is the closest terminal to your destination. Check that your seat belt is secure and switch off that in-flight film — your exciting trip to Dnipro is about to begin! Located in the heart of Dnipro, this luxury hotel is within 1 mile (2 km) of Dnipro Arena, Globy Park and National History Museum. Dnepropetrovsk National Univesity is 2.6 mi (4.2 km) away. 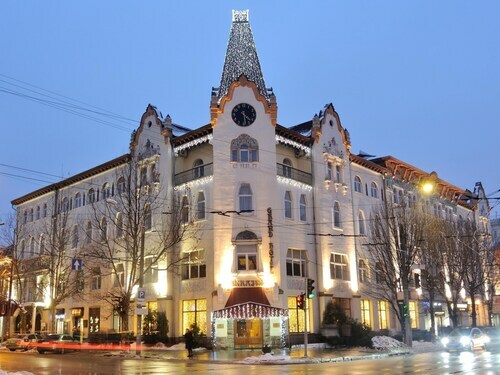 Situated in the historical district, this hotel is 1.2 mi (1.9 km) from Globy Park and within 3 miles (5 km) of Dnipro Arena and National History Museum. Dnepropetrovsk National Univesity is 5.1 mi (8.2 km) away. Situated in Dnipro, this hotel is 0.5 mi (0.9 km) from National History Museum and within 3 miles (5 km) of Dnipro Arena and Globy Park. Dnepropetrovsk National Univesity is 2.3 mi (3.6 km) away. 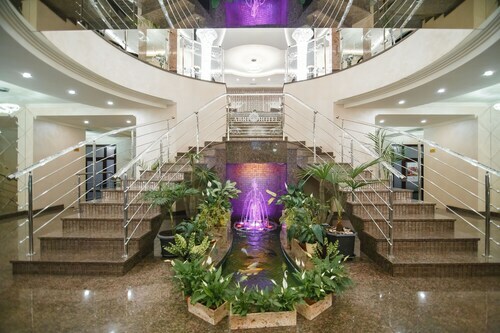 Located in the heart of Dnipro, this hotel is within a 15-minute walk of Globy Park and Dnipro Arena. National History Museum and Dnepropetrovsk National Univesity are also within 3 miles (5 km).